“Love” the word not the weirdo. (3) Spanish Guy Fawkes goes by Fawkes, Guido. To die were abandoned on crude desert trees. One another unmistakably, bare winter trees. Tucked a wildflower in the heart of the other. The wound of the first home will never close. Effervesce in the footprints of young women. More than historical, as if it could be stopped. Things, belly down, slithering out of the sea. Removed the body of Christ from the cross. With Gabriel’s voice barking from the receiver. 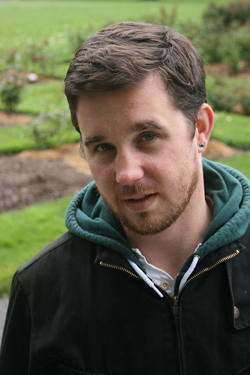 Matt Rader is the author of two books of poetry, Miraculous Hours and Living Things. A third book of poems is forthcoming. His poems, stories, and critical prose have appeared in journals, magazines, newspapers, and anthologies around the world. He is an instructor of Creative Writing at Kwantlen Polytechnic University in Vancouver, British Columbia and currently teaches English at North Island College in the Comox Valley, Vancouver Island, British Columbia. If he could, he’d rub Graham Nunn’s back in the tiniest of circles.